Your Dentist in Waco Uses CEREC to Make Crowns in Minutes! If your teeth have become severely decayed or you’ve recently experienced a dental injury, you’ll likely need to have a dental crown placed to protect yourself. Damaged teeth are far more likely to become infected because they’re exposed to bacteria in the mouth. However, even after knowing this, you still may not want to deal with the restorative process. You don’t want to schedule multiple appointments and don’t enjoy taking the mold necessary for a crown. But your dentist in Waco has something to help convince you. With the help of CEREC technology, your dentist can make a restoration for you the same day you come in. Keep reading to learn how. How Long Does It Take to Produce a CEREC Crown? When you have a severe cavity that fillings won’t solve, dental practices would typically schedule you for a future dental appointment while they fabricate a dental crown in Waco. With a CEREC machine, your dentist can not only produce a restoration the same-day as your initial appointment, they can produce it in minutes! Compared to traditional molds sent to an off-site dental lab, there couldn’t be a faster method for creating restorations. Not only is it faster, but your dentist doesn’t have to wait for crowns from other practices to complete before getting yours created. By keeping it in house, you can be out the door with your high-quality dental crown in very little time thanks to CEREC in Waco. CEREC stands for Chairside Economical Restoration of Esthetic Ceramics. Your crown is made of solid porcelain and the “mold” you used to provide is replaced with CAD/CAM technology, which stands for Computer-aided Design/Computer-aided Manufacturing. The dental lab that your dentist used to use is now entirely at their disposal. The process is broken down into four main steps. First, your dentist takes pictures of your current tooth using an intraoral camera. After cleaning and preparing your teeth, he takes another set of pictures to create the final blueprint of your teeth to ensure the crown matches your current tooth. 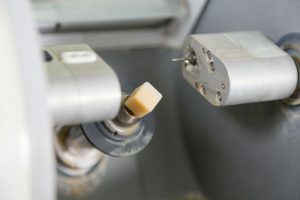 Then, the dentist uses the information from the images in the computer of the milling machine. This allows it to carve a durable and biocompatible dental crown. Next, your dentist will smooth out any rough spots and glaze the crown to match the rest of your teeth. Finally, he’ll etch adhesive on the crown, so it can securely bond in place. He’ll confirm the fit and bite is good before letting you walk out the door. What are the Benefits of CEREC Technology? Not only does it save you time of a second appointment, it saves you the additional cost of that additional visit as well. That’s time saved by the dentist as well. Since they are creating the restoration in house, they don’t have to pay a dental lab the required fees to produce the crown. That just means he can transfer those savings onto you. Furthermore, making adjustments to a crown that doesn’t fit properly is much easier. Ensuring that you’re wearing a crown that fits comfortably, naturally, and protects you from harmful bacteria is imperative. As a bonus, getting a dental crown after an injury is much easier thanks to CEREC. Producing your crown shouldn’t take days or even weeks. Schedule an appointment with your dentist in Waco today to protect your teeth! Premier Family Dental uses the CEREC procedure to create same-day crowns of the highest quality. Thanks to Dr. Rick Cofer’s highly professional and knowledgeable dental team, you can also expect a friendly environment with an unmatched level of expertise. To contact the practice, call them at (254) 732-0309 or visit their website. by: Dr. Rick Cofer at February 13, 2018 . Comments Off on Your Dentist in Waco Uses CEREC to Make Crowns in Minutes!